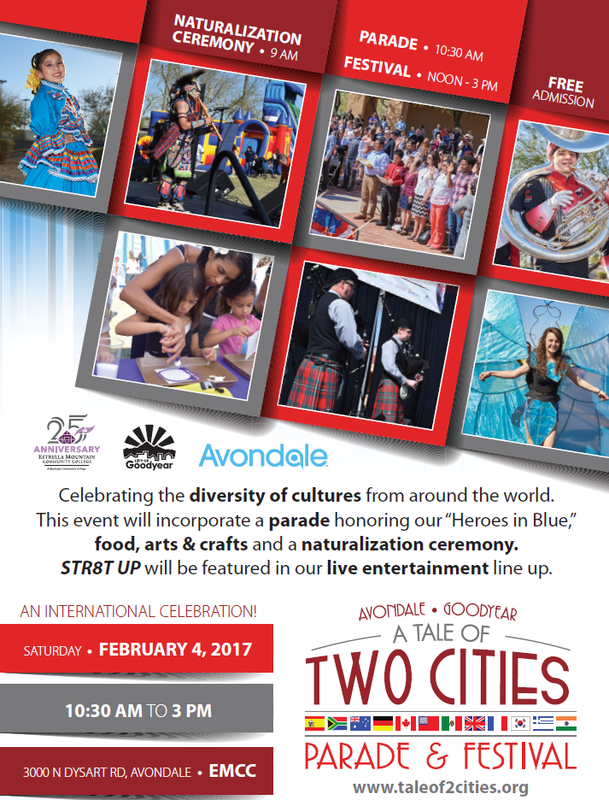 The cities of Avondale and Goodyear will celebrate the multi-cultural flavor of the Southwest Valley with an internationally-themed Tale of Two Cities Parade & Festival on Saturday, Feb. 4, 2017, at Estrella Mountain Community College (EMCC). This community wide celebration is free and open to the public. Festival: noon - 3:00 p.m.
At 10:30 a.m. the parade will start at the Goodyear Community Park on Litchfield Road, and proceed along Thomas Road, ending at the festival site at Estrella Mountain Community College. The festival will run until 3:00 p.m., offering two stages with music and dance, in addition to a feature performance by Str8up. Also featured are worldly food options, multi-cultural displays, vendors and education booths. EMCC will also have a special booth commemorating the college's 25th anniversary with historical memorabilia and an opportunity for the community, alumni and students to contribute to a special time capsule. 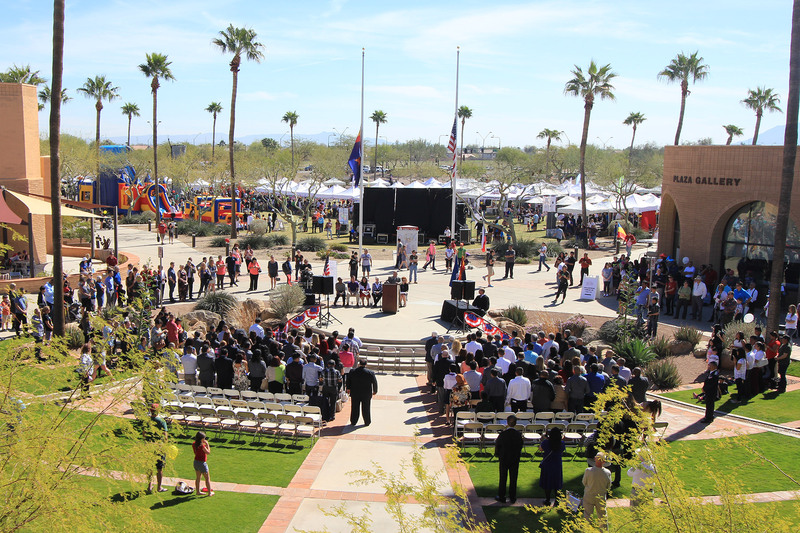 This year the event begins with a Naturalization Ceremony on the Main Stage at 9 a.m., where more than 100 individuals will take the oath of citizenship to become America’s newest citizens, presented by the United States Citizenship and Immigration Services (USCIS). The keynote speaker at the Ceremony is naturalized citizen Gary Hart, a police officer of Goodyear, originally from Jamaica. Stage entertainment will feature a series of performances representing many of the world's cultures. Fans will enjoy song, instrumentals and dances performances from multiple cultures. The list of performers include music provided by the entertainers of Str8Up, reggae music by Patrick Murillo, drumming beats from Arizona Rhythm Connection, authentic India dances by Sampradaya Dance and more. The parade will promote various cultures from around the globe, with music and performances from a variety of artists to complement the experience. With approximately 80 parade entries, the procession will also include decorated floats, marching school bands, cultural dance groups, local celebrities and state political figures, celebrated mascots, foreign makes of antique and specialty vehicles, community and school clubs, scouts, and more. This year’s event also honors our local law enforcement in the West Valley, as the parade spotlights ‘Heroes in Blue’. To parade will feature the Police Chiefs of Avondale and Goodyear as official Parade Grand Marshals, representing the dedicated men and women in the police force. A few of the many highlight entries of the parade include WWII Stearman Bi-Planes (fly over), Wells Fargo Stage Coach, El Zaribah Shrine Miniature Cars, colorful Folklorico dancers, and street dance performance of the Chinese Dragon from Dynamic Wushu, local school bands, a special display of historic military vehicles from the Frank Luke Jr. Memorial Museum collection and more. Authentic food from areas around the world including British, Mediterranean, Australian and more. Some of the confirmed food vendors include BarbeSkews, Down Under Foods, Zeta’s Grill, Costantino's Italian Kitchen, Molly's Tamales, Cactus Corn, and Mister Softee. Children will be able to take part in free activities and fun. The zone will include a bounce house, rock wall, carnival games, face painting, and crafts for the kids. Vendors, businesses, community organizations and sponsors, as well as city services from Avondale and Goodyear, will be participating to provide information and opportunities. Arts, crafts and food booths help create the international theme. Estrella Mountain Community College will also have multiple academic displays, and will provide feature spotlight on the campus celebrating 25 years of being part of our community. Free parking will be available at St. Thomas Aquinas Church (enter from 137th Ave.), Palm Valley Elementary (enter from 135th Ave.) and Estrella Mountain Community College (enter from the North, off Dysart Rd). For further information, visit www.taleof2cities.org. The Tale of Two Cities event is coordinated by the cities of Avondale, Goodyear and Estrella Mountain Community College, supported by local sponsors: Abrazo West Campus Hospital, Cox Communications, EMCC Culinary Department, A-Z Rentals, SRP, Sam’s Club, Desert Diamond Casino, and is facilitated by Goosebump Marketing & Events. For further information contact Avondale Recreation at 623-333-2400 or Goodyear Parks & Recreation at 623-882-7525.